Portrait Mode has been a mainstay of the higher-end iPhone lineup since the iPhone 7 Plus. The iPhone 8 Plus and iPhone X both sport the feature, though the latter even has it on the front-facing TrueDepth camera. Unfortunately if you have an older device, you won’t be able to take advantage of native portrait mode. So if you want portrait mode on an iPhone 6, you’re out of luck. But if you do own a device that lacks the dual-lens camera, you might be able to get similar results with a few third party camera apps instead. Some of these apps require a little bit of work from the user, but the results speak for themselves. PortraitCam is a simple yet powerful app that provides users with plenty of tools. It’s up to you whether you want to snap a new photo directly with PortraitCam, or you can just import it from your Photo Library. If you happen to have an iPhone X (our review iPhone X Review: The Future Has a Price iPhone X Review: The Future Has a Price The iPhone X is a flagship, business-class device. It's the first generation of a new generation, and such devices always come with a few pitfalls. Read More ), PortraitCam can utilize the TrueDepth camera to preview and capture depth data live, which gives even better results. When you have your image in PortraitCam, the app will automatically try and detect all faces in the photo. For the most part, the results are decent, but do require a bit of tweaking to be perfect. Just paint the depth mask on the areas you want in focus, or erase the mask when it’s over edges. Once the masking step is done, PortraitCam keeps the subject sharp, while blurring out the rest. There’s plenty of other features that make PortraitCam worth adding to your photography toolkit. You can adjust the strength of the blur itself, so you can go for a more subtle or overly drastic aesthetic if you prefer. The app allows you to change the aperture of the blur, which tweaks the shape and direction of the bokeh effect. Other tools are available like spin, highlights, fringe, basic editing tools, and more. To top off your depth-of-field photos, PortraitCam provides a few lighting flares and filters that can make your portraits pop. These are completely optional, but help create unique images that’ll be sure to impress if done right. PortraitCam is one of the pricier options, but it does pack in plenty of useful tools. If you’re looking for more bokeh to add to your portraits, FabFocus helps you achieve just that, with little effort. Like PortraitCam, FabFocus allows users to snap new photos directly with the app or just import from the Photo Library. The interface is simple enough, but does feel a bit clunky compared to other apps. It’s also slower in terms of detecting faces automatically, but produces more accurate results, which seems like a fair tradeoff. Once the app has the image, it gets right to work. It performs a facial analysis to determine the faces in the photo, and then finds the rest of the subject, such as the body or bust. Then it blurs the background while keeping the subjects in the foreground sharp and crisp. Still, even though FabFocus seems more accurate than other apps, it’s not perfect. You may need to do some fine-tuning on the edges, or erase the mask on part of the background. FabFocus lets you go into editing mode, where you can paint in the focus mask or erase it with your finger. You can also adjust the strength of the blur, size of brush for the mask, as well as apply shaped bokeh to point lights in the background. When you paint in or erase the focus mask, the actual part that paints or erases is above your finger. This is designed to make it easier to see where you’re painting, and not have your thumb or finger block your view. The end result is more accurate depth-of-field that doesn’t look fake. The only issue with FabFocus is the fact that the app works a bit slower compared to others, and may freeze up occasionally. Just want a super simple app for adding depth effects Learn About Depth of Field: 5 Easy Lessons to Improve Your Photos Learn About Depth of Field: 5 Easy Lessons to Improve Your Photos Understanding what depth of field is, how to alter it, and some of the different artistic things you can do with it will all help you progress your photography to the next level. Read More to your images? Then Fore Photo gets the job done. Fore Photo has a minimal user interface that stays out of the way and it’s super fast and responsive. Unfortunately, Fore Photo only lets you import from your Photo Library, so you can’t just snap a new photo while using the app. But accessing your older images is quick and easy. The moment you load your photo into Fore Photo, the app uses a neural network to automatically detects subjects in the foreground. It then blurs the background in a way that’s similar to shallow depth of field on DSLRs. Like other apps, Fore Photo is not perfect, though it’s fairly accurate. You can edit the focus mask by painting what you want in focus, and use the eraser tool to clean up the edges. Changes are rendered quickly and effortlessly, much faster than the competition. There are five settings for the strength of the blur, which you can select in the toolbar under the photo. The default option is always the middle, but you can go left for more subtlety, or right for more extreme depth. Fore Photo is free to use, but does put a small, non-intrusive “Fore” watermark in the bottom right corner of every image you edit with it. If this bothers you, a $1.99 in-app purchase will remove the watermark. Again, Fore Photo is a basic and bare-bones app that lets you instantly apply depth effects without fuss. If you want more tools, then other apps are better suited for the job. For those who want a smart app for achieving depth effects in their images without costing too much, AfterFocus is a good contender. AfterFocus has a pretty basic interface that’s easy enough for anyone to understand. Users can snap new photos directly with AfterFocus, or import from the Photo Library. A neat feature in AfterFocus is the Double Take option, where you can take two photos. To utilize this feature the best, just snap the first image as you’d want it, making sure the subject is close to the lens and far from the background. Then you move the camera about one centimeter to the right, and then snap the picture again. Double Take analyzes the image and should recognize the nearest object, eliminating the need to draw a focus area. Another nifty tool with AfterFocus is the smart focus area selection. With this, all you need to do is draw a line inside the focus area (white), and then another in the background (black). AfterFocus automatically recognizes the focus area and does its magic. Of course, it’s not always going to be perfect. You can still do things the manual way, by finger painting your subject area. Like the other apps, the amount of blur can be adjusted through a slider. For a gradual blur, users can select the “Edge Feather” option or use the Fading Background for a more natural transition. AfterFocus even has motion blur to help emphasize moving backgrounds. There are a handful of different aperture styles to go along with the blur, and you can add bokeh too. If you prefer to add filters to your photos to share on social media, AfterFocus includes a nice selection, including professional ones like Cross Process. Some effects, like vignetting and stickers, also come in AfterFocus. Sharing’s made easy with AfterFocus, but a word of caution: image metadata gets stripped after editing in this app. If you don’t care about the EXIF data, then no worries. Otherwise, another app may be a better choice. If you already have an iPhone 7 Plus, iPhone 8 Plus, or an iPhone X (our complete user guide to the ihone X The Complete Guide to Using Your iPhone X The Complete Guide to Using Your iPhone X The iPhone X rewrites 10 years of iPhone history, and with it 10 years of muscle memory. Here's how to adapt to Apple's new way of doing things. Read More ), but want to get even better depth-of-field images, then Focos is worth checking out. With Focos, users can snap photos directly within the app. The camera in Focos is substantially better than the standard camera, as the depth effect is rendered live, so you get a preview of what you shoot. Because of this, it’s better than snapping a photo and seeing the results after the fact. You could also import an image into Focos, but the app limits you only to depth effect photos on your device. 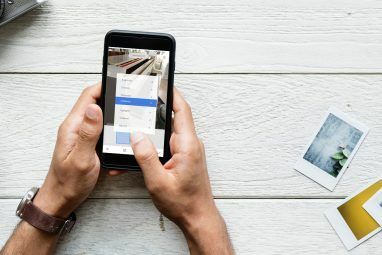 When you’ve decided on an image to use, Focos can make it even better in just a few taps. Focos allows refocusing after you took the photo, and all you have to do is tap on the point of focus you want. If you tap on the background, it becomes crystal clear and the foreground’s blurred instead. Don’t like it? Just tap again. Focos has a wide selection of aperture shapes and diaphragms, in case you want to go after the bokeh effect. There are also lenses that affect the aesthetics of the bokeh, and can even apply cool effects like fisheye and wide angle views, depending on the image. Focos even has 3D mapping, in case you’ve ever wondered how the camera captures depth of field. There are a few negatives about Focos, though. The first caveat is the fact that the app only works on devices that already have Portrait Mode, but it greatly enhances them. The second flaw is how most of the features are locked behind the Pro Version of Focos, which is on a subscription-based model. You can pay $0.99 a month, $5.99 a year, or get unlimited access forever for $9.99. At least there’s a two-hour trial, so you can dip your toes in the water first before going all-in. Still, Focos is a good addition to have in your photography toolbox if you own an iPhone 7 Plus, iPhone 8 Plus, or iPhone X.
What’s Your Favorite App for Portraits? Whether you’re a professional or amateur photographer, “the best camera is the one that’s with you.” And since most of us carry our smartphones with us, it’s our camera-of-choice when it comes to snapping quick pictures or memorable portraits. While the iPhone’s cameras A Quick Start Guide to the iPhone Camera A Quick Start Guide to the iPhone Camera The iPhone is still the most popular point-and-shoot camera on the planet, but many users still aren't away of all that the camera can do. Here's what you need to know. Read More have certainly improved over the years, they’re still not DSLRs. But with apps that replicate depth effects on older devices, or even enhance existing Portrait Mode devices, portrait shots from iPhones are giving DSLRs a run for their money. We may not have Portrait Mode on the iPhone 6 (or even older devices), but we can certainly get close. If you love taking photos, you might be curious about these iPhone camera accessories The Best iPhone Camera Accessories: Lenses, Cases, Remotes, and More The Best iPhone Camera Accessories: Lenses, Cases, Remotes, and More Looking for iPhone camera accessories? We've rounded up the best iPhone lenses, camera remote, camera case, and more. 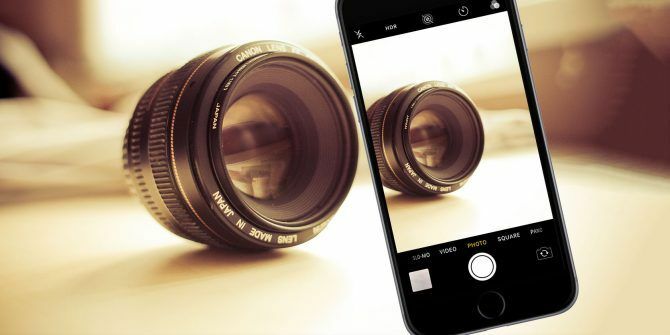 Read More and iPhone camera hacks The 7 Best iPhone Camera Hacks You Must Try The 7 Best iPhone Camera Hacks You Must Try These iPhone camera hacks will let you unlock more features of your phone's camera. Try them out and take even better photos. Read More .